Morning all - we're on our second XPS 13 (first was a (9343). This one is splendid, except for the above: if the computer is off, then it boots up fine, but if 'Restart' is selected from the Windows 10 'Power' option, then it freezes on the Dell logo (no spinning lights even). Since I am in the process of trying to install everything and set up the laptop, restarts are frequent! I do not want to activate another Office licence (already lost one at £42) if this is problem cannot be solved - so I have about 10 days left. All the drivers are up to date - BIOS is at the newest, v.1.00! - but the problem persists. Any ideas? I did try changing the boot order in BIOS (HD-/Win. Boot Man.) but it's made no difference. I can re-boot if I turn the laptop off and then on again, but it will not 'Restart' from the Windows 10 Start button/Power. It does re-start back to Windows if I exit the BIOS screens though. I have exactly the same problem with my new XPS 9350, reboot with UEFI mode failed. I had to install windows 10 on Legacy BIOS for proper operation. Can the DELL support bring us a solution ? I have the exact same Problem. New XPS13 9350. Cleaninstalled Windows 10 Pro in UEFI Mode. Can't reboot. I can't install any Updates that require a clean restart. Morning gents (I assume) - once again, I pleased to have support with the problem, though sorry that you're both having it too. 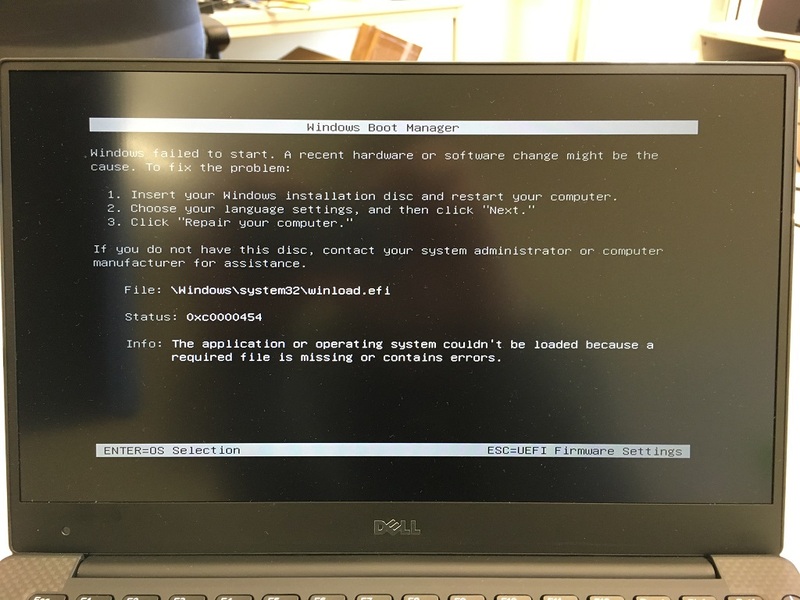 LemarieC: 'I had to install windows 10 on Legacy BIOS for proper operation.' That's interesting - it never occured to me to try running in legacy mode. I may give it a go... However, your mornful cry for Dell support will go on deaf ears here (at least, that's what's happened to me). I think its Ram failure. Try if you have more than one ram memory try one by one removing them. But firstly i recomend safe clean the ram memories. Safe clean mean clean them with somethin soft. If thats not an option maybe its the chipset. But nothing its sure if problem come again. So then you need to send it to the professionals. Power cycling the Machine works. It just does'n reboot. No Warm-Start. I think an EFI Update is required. Idefix: In UEFI, under 'General/Boot Sequence' there is a button on the right for 'Add Boot Option' (under the boot sequence list). Click the button and you get to the 'Add Boot Option' screen. You must enter something in 'Boot Option Name' (anything) and at the bottom in the 'File Name' box, click the three dots (...) to browse. This opens the 'EFI Boot Selection' box. From memory, under 'Directories' there were two options my wife's XPS. Click on the 'EFI' option (I think!) and the above file shows; select it and 'OK' out of everything before you 'Save Changes' (or similar) to exit UEFI. But again, it does not affect the re-start problem. The XPS will re-boot out of UEFI back to Windows, but re-starting Windows 10 from the 'Start Button/Power' results in freezing, as first post. I'll try to post on the Win10 forums now: we'll see. Ah, yes. My apologies Idefix - I mis-read your post and thought you were referring to cold starts, not 'rebooting': my mistake, sorry! Maybe this release solve our UEFI issue... ? Does anyboby have tested ?